Get Help with Splash, ArtThread's online art-making tool. Welcome to the ArtThread Gallery - we're so glad you are here. Imagine an art gallery where you can respond to the art by hanging your own artwork next to anything that moves you. Someone else can come along and do the same, and that begins an art-to-art conversation - an "art thread." This is the essence of the ArtThread Interactive Online Gallery. On our home page you will see the Main Gallery where you can browse the art at random or look at the "art threads" which are created by people responding to art on the Gallery. All the art on the Gallery belongs to a thread, and you can join a thread (by adding your art to it) or start your own fresh thread. Start by browsing in All Art view or Thread View, and if you see something you like, click on it. You will now be in the Art Detail page, where you can respond to this piece of art, or add your art to the thread in which this piece lives on the Gallery. Everything you do on the Gallery is done in your internet browser. Approved browsers include Firefox, Safari, Chrome, and Internet Explorer (version 7 and above - Explorer version 6 does not work!). We support both the PC and Mac platforms. In whatever browser you use please have Adobe Flash Player installed - you can get it free here. For best results we recommend a broadband internet connection. Just about any computer that meets the above mentioned requirements will work. We do recommend at least 500 megs of RAM for a smooth ArtThread experience. 1. 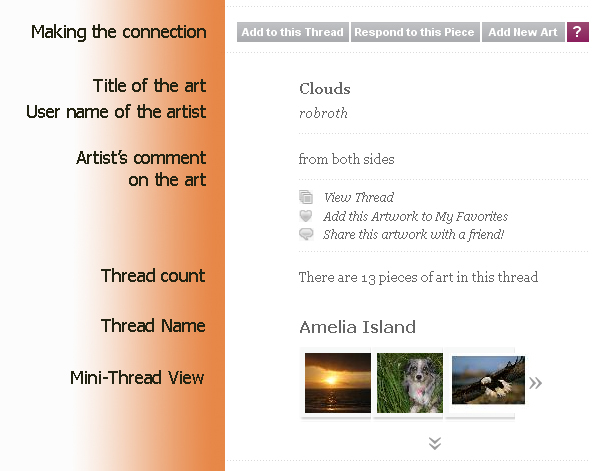 Register for your ArtThread account - you will need to log-in in order to use the Gallery's features. 2. Add art from your computer. This can be scans or photos of your favorite artworks, or your photography, or any image you want. All uploads go to your own My Gallery, and this is created for you when you register with ArtThread. You need art here in order to join the conversation. 3. Create art online with Splash! : Unpredictable, sophisticated, and just plain fun. Go for it! Saving your work takes it to My Gallery. 4. Start or Respond to a Thread: After you have art in My Gallery you can start a fresh thread, or browse the main Gallery and respond to an existing thread or a specific piece of art. 5. Share your work with a friend: The best way to share is to click on the art you wish to share, then choose Share with a Friend. Creating a community with your art is just a click away. All Threads: This view gives you a look (zoomed out only) at the first piece of art in each Thread on the Main Gallery. Use this as a starting point to browse through the Threads. Click on an image and you will go to the Thread View for that Thread. All Art: This view gives you a view of all the art in the main ArtThread Gallery. Art is displayed individually without regard for its position on any Threads. Use this view to brows through take a walk and browse the Gallery. You can zoom in and out on this view using the magnifying glass button. Thread View: This view shows you one Thread. If you keep pressing this button you can cycle through all the Threads in thou will have a chance to send a short message along with the art, and your friend will be able to see the art in an email, as well as click-back to the ArtThread site and see the Thread your art lives in. Slide Show: Choose this to create a slide show of art from your Gallery. Choose individual pieces of art and adjust the time each appears in the show. When you are ready ArtThread will create a unique web page for your show, and you can send that as a link to friends so they can see your work! Preferences: Here you can maintain your contact information, reset your password, and store your credit card information if you choose. Mail: This takes you to your message center. Here you will see notifications when someone responds to your art or to Threads in which your art resides on the Main Gallery. From time to time the ArtThread Team will send a message regarding the site, and this where you will see those messages. Shop: This takes you to The ArtThread Store, where you can purchase various ArtThread items. Coming soon: custom one-of-a-kind items imprinted with your artwork! View History: There is no button for this, but look toward the bottom of the My Art screen and you can see a record of all the art you have looked at on the Gallery. This is a great way to find something you saw so you can add to that conversation! When you click on an image in the Gallery you arrive here, where you can look at the art in its largest form. Click the art again for a cool "lightbox" effect. To the right of the image is the dashboard for making your art connections on the Gallery, shown below. Add to the conversation by placing your art in the thread this art belongs to. Inspired by this piece? Respond directly to this art. The person who placed it will get a message saying they have a response! Before you can Add to the Thread or Respond to a Piece you will need to have your art in My Gallery. Choose Add New Art and upload all you want! You can come back to this piece easily - it will be the first one in the View History in My Gallery. This is a small slice of the Thread this art belongs to. In this case, the art is in the Amelia Island Thread, and there are a total of 13 pieces in that Thread. Use the arrows to browse the Thread from here, or choose View Thread for the whole picture. This is the page you use to get your art into the ArtThread Gallery. Once you upload your art or save something from SPLASH! the art always goes first to your My Gallery page, in the My Art section. From there you can use all the interactive tool icons and post your art to Threads. Upload Art: Choose this and you will go to the Upload Art page. Press the Browse button to look for a file on your computer. Files can be from scans of your art, from photos you take with your camera, or even art you make with drawing programs like Photoshop or Paint. Have fun and express your self! The Gallery can accept the following file types: JPG, BMP, or PNG. Other types will not work, so you use whatever file conversion programs you have and convert other types to the acceptable file type. File size is also important - we recommend file sizes of 300 KB to 3 MB. The higher the resolution and file size, the better your image will look if you decide to get reprints, or imprint your art on items from the ArtThread Store (coming soon!). Create Art Using SPLASH! : Choose this to jump into the pool and experience the joy of SPLASH! This online art-making program has something for everyone. You can create a unique and unpredictable piece with just a few mouse clicks, or you can take advantage of the full power of all the SPLASH! tools and create something extremely sophisticated -- there are tools here that you cannot find in any other drawing program! Start a New a Thread: You can do this from other places on the ArtThread Gallery, and it is also available here on the Add Art page. Choose this to start a new art conversation. You will get a chance to name the Thread and put in the first piece of art. Your art can set the tone for the Thread so go for it! The icons below each image in the Gallery are your shortcuts to all the actions you can perform with art in the Gallery. You will find these actions are also available to you in other places, but icons are your fastest way to work with a specific piece of art. Connect and Respond: This takes you to the Art Detail page -- your dashboard for interacting with art you see in the Gallery. View Thread: This takes you to the Thread View for the Thread in which this art is posted. You will see how this piece of art relates to all the art around it. Add to My Favorites: This piece of art will be added to the My Favorites section of My Gallery. Use this to add other people's art to your personal Gallery. Share with a Friend: This takes you to a page where you can send an email to a friend that includes the art and a message from you. Invite someone to join the Gallery today! Start a New Thread with this Art: Use this to take your art and start a brand new thread, with this piece of art as the first piece in the thread. Make a Product with this Art: Click this link and you will be able to make a product (apparel or a household item) that you can buy which is custom imprinted with your art! Download this Art to Your Computer: Use this to download this piece of art to your computer!